Visit the Raiders' official website for your daily fix of team information. 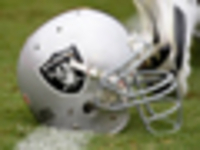 Mike Mayock and Jon Gruden sent the Raiders' scouts home for the weekend and do not expect them to return by draft time, sources told NFL Network Insider Ian Rapoport on Friday. The Oakland Raiders own three first-round picks in the upcoming NFL draft. General manager Mike Mayock relays what advice head coach Jon Gruden recently imparted. Former Oakland Raiders head coach Jack Del Rio ended his silence on the blockbuster trade that sent outside linebacker Khalil Mack to the Chicago Bears in September 2018. The Raiders have parted ways with receiver Seth Roberts after four seasons in Oakland. The move is the latest of Oakland's complete overhaul of their receiving corps this offseason. The Oakland Raiders are holding a private workout with former Oklahoma quarterback Kyler Murray on Monday in Dallas, according to NFL Network Insider Ian Rapoport. The Raiders announced they have signed free-agent tight end Luke Willson, who caught 13 passes for the Lions last year after logging five more productive seasons with the Seahawks. The Raiders are one of five teams eligible to be featured on HBO's "Hard Knocks." Owner Mark Davis said participating in the reality show would be a distraction for his team. The Raiders have gotten final approval for their lease to remain in Oakland for at least one more season. The Oakland City Council voted Thursday to approve the lease for 2019 with an option for 2020. George Iloka's best seasons came with the Bengals under the guidance of defensive coordinator Paul Guenther. The two could be reuniting as the free-agent safety will be visiting the Raiders on Wednesday. Now that Vontaze Burfict will be joining the Raiders, what does the hard-hitting linebacker think about his teammate and former rival Antonio Brown? Vontaze Burfict and the Raiders agreed on a one-year deal worth roughly $5 million, including incentives, NFL Network Insider Ian Rapoport and NFL Network's Tom Pelissero reported on Tuesday evening. 4/16 Benson Mayowa (DE) Unrestricted Free Agent Signing (unrestricted free agent signing). 4/15 Justin Murray (OT) Exclusive Rights Signing (exclusive rights signing). 4/15 Daniel Carlson (K) Exclusive Rights Signing (exclusive rights signing). 4/15 Marcell Ateman (WR) Exclusive Rights Signing (exclusive rights signing). There is no content published. Please check back later.